Our guide to Door Bells offers detailed descriptions of companies such as Signature Hardware and SpitJack. Seattle company manufacturers and designs modern mechanical doorbells, garage door openers, light switches and house numbers. The Baltic nation of Lithuania is home to Baltica, a manufacturer of high-end, handcrafted hardware in solid brass and bronze. Doorbells, door entry sets and other hardware is available through dealers in many countries. Online retailer of hardware and accessories for the home, including cabinet knobs and handles, and switchplates in various configurations. Decorative hardware for cabinetry and furniture, address numbers, bathroom hardware, doorbells and more are available from this online retailer and designer. Manufacturer of a full line of wireless and hard-wired chimes as well as wireless and wired doorbells. 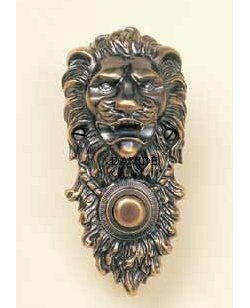 Solid bronze door bell is rich in detail.